Prescription Doctor offers a confidential and efficient way to buy the prescription medicine you need. We use only qualified, UK registered prescribers. All medication is sourced from UK registered pharmacies. If approved, your medication will be dispatched quickly for a next day delivery. What is Codeine Phosphate used for? What Codeine dose is right for me? Is a prescription needed for Codeine? 1. Fill in our simple medical questionnaire. Ensure you provide all relevant details. 2. Our fully qualified and registered prescribers will review the information provided to make sure the medication is suitable for you. 3. A prescription will be issued and medication could be sent the same day*. All medication is branded and there are no hidden fees - the price shown is the price you pay. 4. Medication will be sent in unbranded, discreet packaging from a registered UK pharmacy. A company name only (no reference to medication) will appear on your bank statement. *On orders approved before 3pm GMT. "Codeine Phosphate is part of the opioid family of medications. 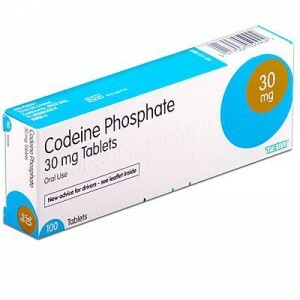 Often prescribed in conjunction with Paracetamol (Solpadol and Co-Codamol) for effective pain relief, codeine phosphate is also used to treat painful diarrhoea not caused by toxic substances. Codeine Phosphate may be used as a cough suppressant to give respite from painful, coughs that expel no mucus." Mohamed Imran Lakhi, Superintendant Pharmacist. The human brain contains opioid receptors that normally respond to endorphins, the bodies natural, painkilling chemicals. Opioid medications like codeine phosphate work by attaching to those receptors, mimicking endorphins to produce a feeling of well-being and an overall reduction in pain. Because opioid receptors are found throughout the nervous system, Codeine Phosphate will also affect the digestive system and suppress the cough reflex. Codeine Phosphate can help with short-term pain management. It is often recommended for pain that has not responded to over-the-counter (OTC) medications. It is also used to as a treatment for diarrhoea and to suppress painful dry coughs. Dosage varies from patient to patient. Always follow the guidelines set out by your prescriber. Take one to two - 6 - 8 hourly. Where 60 mg has been prescribed, take ONE 6 - 8 hourly. If you miss a dose of codeine phosphate, take your dosage as soon as you remember. Wait at least four hours before the next dose. Do not take two doses less than four hours apart in an attempt to make up for a missed dose. If you take too much codeine phosphate, seek immediate medical attention. Take the packet for the medication with you. Tell medical professionals how much codeine phosphate you took and when you took it. Avoid taking any medication during pregnancy whenever possible. Insufficient evidence exists to determine if Codeine Phosphate is safe during the first and second trimester. If Codeine Phosphate is taken regularly during the third trimester, the baby may experience opioid drug withdrawal symptoms after birth. Codeine phosphate may also pass into breast milk, so nursing mothers should avoid using it. Protracted use of codeine phosphate may lead to tolerance, meaning the drug will not work as effectively as when you first took it. Continued, long-term use may also lead to physical dependence on the drug. You will experience withdrawal symptoms when you stop taking it. For these reasons, do not use products containing codeine for longer than recommended by your prescriber. Anyone who uses codeine phosphate should be aware of possible side effects ranging from common to rare issues. Most people will not experience any side effects of codeine at all. Do not drink alcohol while taking Codeine. Alcohol use increases the likelihood and severity of symptoms. If you experience any of these side effects, please seek medical attention. You should also be aware of the symptoms of an allergic reaction to codeine. Hives, skin rashes, swelling of the lips or tongue, and difficulty breathing have all been reported. If any of these symptoms appear, seek medical help immediately. Make sure codeine is the most suitable medicine for you. Always tell your prescriber about any medications or supplements you are taking, to avoid possible interactions with other medicines you are taking. Also inform your medical professional of any pre-existing medical conditions or allergies. Store codeine in a cool, safe place away from children and animals. How is Codeine Phosphate Taken? Codeine phosphate is taken in tablet form, in dosages ranging from 30 mg to 60 mg. At least four hours should elapse between doses, and no more than four doses should be taken in any 24-hour period. Can you take paracetamol or ibuprofen with codeine phosphate? Yes, it is safe to take codeine phosphate with other painkillers such as paracetamol and ibuprofen. If you are taking a painkiller which contains both codeine and paracetamol, it is advised not to take other medication which also contains codeine or paracetamol. How Long does Codeine Phosphate Stay in My System? On average, reports suggest Codeine Phosphate will not be present in blood tests after 24 hours, and will not be measurable in urine tests between 2 and 10 days after taking it. How Does Codeine Cause Constipation? Codeine causes constipation by slowing the transit of food through the digestive system. It also suppresses some natural intestinal function. This makes it a useful drug for controlling diarrhoea. Always drink plenty of water when taking codeine to minimise this effect. Does Codeine Phosphate Work for Everyone? Codeine Phosphate does not work for everyone and may not work for you. If, after taking the medication for a while, you notice it no longer relieves pain, you may have developed a tolerance to it. In addition, a very small percentage of people are not able to metabolise opiates, so no dosage will provide pain relief. Increased dosages are not the solution, should you find the medication ineffective, whether you are new to codeine phosphate or have been taking it a long time. Increasing the dose or frequency could lead to dependence or an overdose. Instead, speak to your prescriber about a suitable alternative. Why is Codeine Phosphate Addictive? Codeine addiction can be both physical and psychological. With repeated use, the body becomes accustomed to the drug. Withdrawal symptoms may occur once it is no longer present in your system. A psychological urge to recreate the feeling associated with codeine phosphate may remain long after the medication is gone. If addiction is a concern, speak to your GP or visit talktofrank.com for more advice. Does codeine make you tired? Yes, codeine can make you sleepy. You may feel sleepy for a few days after your first few doses. Your body will adjust to the medicine and the sleepiness will wear off. If you feel less alert while taking codeine painkillers, it is advised not to drive or operate machinery. Can you drink alcohol with codeine? Drinking alcohol while taking codeine painkillers can exacerbate side effects, such as feeling sleepy. Therefore, it is best to avoid alcohol while taking codeine painkillers. Both 30 mg and 60 mg strengths require a prescription. Alternative Codeine pain medication such as Co-Codamol 30/500 mg, Dihydrocodeine available, the Codeine content is strictly regulated. Our fully qualified and registered prescribers will be able to determine the correct strength and dosage for your individual needs. What are the dangers of codeine? What's the right painkiller for me? Rated 4.9 out of 5 based on reviews. Product Review: No faults at all, exactly as described. Service Review: Absolutely fantastic, please ignore negative reviews. Ordered at 9am, approved by 11, shipped by 1pm and arrived less than 24 hours later. Price is also very competitive. Communication could be slightly better but other than that, perfect. Product Review: Fantastic service. 10/10. Product Review: Reasonable pricing & great product for moderate/severe pain relief! Means I can finally have a good night’s rest. Service Review: If you’re struggling to get in & see your doctor and need a plan B when you’re poorly & in pain... I really do recommend this service. It was very easy to work through and understand, it’s safe in terms of holding data on your health and self, and instead of just ticking boxes, you get the opportunity to fully inform the doctor/prescriber of your situation both in the form and after when they are checking your medication; where you get to speak to them directly via a chat box! Very professional, super fast & very reasonable pricing for what it is! That includes delivery too - next day & under £4 - that’s ridiculously cheap!! And next day at that price is their standard which is a massive relief when it comes to your needed medication! Means you’ll never go without when you’re in pain/poorly. Definitely recommend!